This piece is part of Ting Yuen's "Sunset Theatre" line within the Artist Diary series. When we moved to Wells, B.C. we thought The Sunset Theatre was the coolest building in town. It's not fancy, but it has a certain presence. 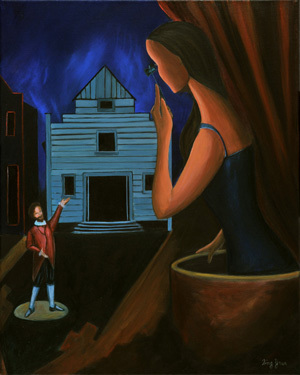 I've always had a fascination for the stage, so I'm really excited about exploring different aspects of it on canvas. Shakespeare wrote "All the world's a stage…" and I agree. Here I create my own script, and play with the contrasts of colors, light and shadows- a reflection of the comedies or dramas we choose to create in our own lives.